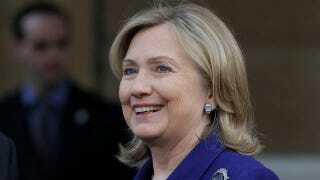 Hillary Clinton continued to show up the rest of the Obama administration in a recent Gallup poll. Her favorable rating is now 66%, her highest ever while serving as Secretary of State, and she's now viewed more positively than President Obama (54% approval), Secretary of Defense Robert Gates (52%), and Vice President Joe Biden (46%). She's liked even by 45% of those who disapprove of the job Obama's doing, and is particularly popular with women over 50, who give her a 77% approval rating. The Many Ways To Say "Hillary Stole Obama&apos;s Balls"